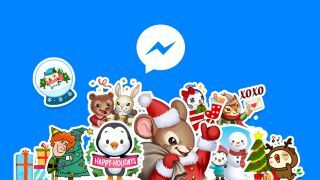 Facebook Messenger is rolling out new features to celebrate the holidays, including its instant-photo sharing feature, Photo Magic. The social media giant first introduced us to Photo Magic last month, when it was still in testing. Photo Magic uses facial recognition smarts whenever you take a photo to remind you to share photos with the friends or family in the snapshot. It can also automatically tag them as well as set up a private group chat with the people in the image, letting you send them the picture with just a couple of clicks. While the Photo Magic update is rolling out to Messenger for Android and iOS this week, if you don't want this feature popping up every time you take a picture, you can disable it. You can decide if you want it to recognize you in photos taken by your friends and family as well. The new update also bring more customization options to Messenger, including adding colored text, emojis and nicknames to separate message threads. For group threads, everyone can change around these customizations, and you'll get a notifications each time a change is made - which we're sure won't get annoying. You also get snow globe heads on Android and a shower of snow flakes whenever you send a holiday-themed emoji on either operating system, even if you're in warmer climes.